Lunch Note Sketch is an ongoing labor of love to combine fun and creativity through daily drawings. The mission is to provide smile-inducing sketches in hopes of sparking a child’s interest in the arts and to encourage creative thinking. Our hope is that you share your notes with our Facebook community and tag your notes on Twitter and Instagram with the #LunchNoteSketch hashtag to show off your creativity. 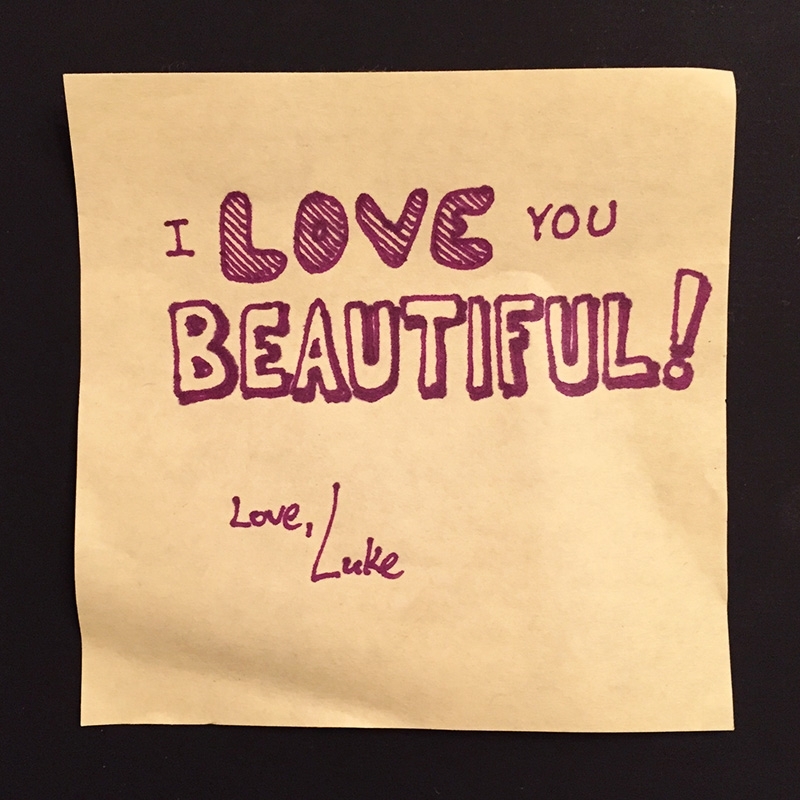 It doesn't take much to show your kids or friends you care about them, and what better way to do that than writing on a sticky note and hiding it somewhere to be found. So, grab a pen or pencil and get creative! One of the notes I left in the car for my wife. Lunch Note Sketch officially started in May 2015. But before starting Lunch Note Sketch, my wife and I had jotted notes to one another as little surprises to one another. We usually did this — and still do — when we were apart for a day or more. I will put a note on the dashboard of the car before she leaves to visit family for the weekend or she will add a note to my luggage that I will find when I am away on business. It’s not a regular occurrence, but it is our way of sharing little surprises when we are apart. Lunch Note Sketch, however, was really inspired when my oldest daughter experienced tragedy at the age of 4. The beginning of preschool started out great because my daughter had a teacher--Miss Robin--who was tremendous. Miss Robin was so encouraging of my daughter's creativity and really allowed her to explore different art forms. My daughter loved Miss Robin. Just 3 months into the school year, however, my wife and I received a call that Miss Robin had been inexplicably murdered. It was a difficult time to say the least, but I feared that this tragedy could potentially have a negative impact on my daughter's desire to explore art and be creative. In order to help my daughter get through this tough time, my wife and I started writing/drawing little notes to add to her lunch. After a while, family and friends recommended I post some of my notes online for others to see. And thus, Lunch Note Sketch was born. My hope is that Lunch Note Sketch would get other folks involved in sharing their creations. This is our best impression of a totem pole. Luke Pieczynski is a loving husband and a proud father of three living in Pittsburgh, Pennsylvania. He is a full-time Art Director and Digital Strategist currently working with a multi-billion dollar retail organization. In addition to art and creativity, Luke is passionate about design, technology, leadership, and education.